"If you are a fan of ginger and garlic, then this is for you. 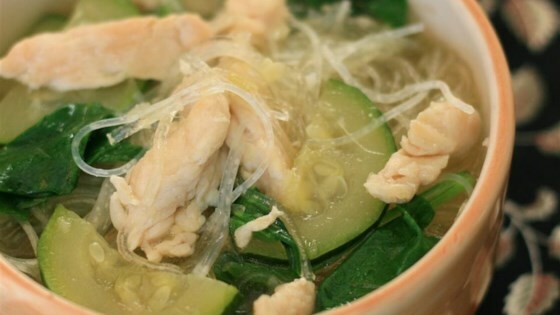 If you have a cold and are tired of the same old chicken noodle, then give this a try. Serve with soya sauce or Maggi seasoning." Bring the chicken broth, garlic, and ginger to a boil in a large saucepan; reduce heat to medium and cook for 10 minutes. Add the zucchini and cook until the zucchini is tender, about 10 minutes more. Stir in the chicken and cellophane noodles; cook until the chicken is hot and the noodles are soft and transparent, about 3 minutes. Stir in the spinach until wilted. Great soup! I was a little worried that it would be bland since there's no salt in the recipe, but its perfect as-is!